When it comes to injection molding, a common request we receive is advice on the right plastics to use in their projects. While we can only provide suggestions, one common point of confusion for our clients is the difference between thermoplastic and thermoset resins. As part of the injection process, both plastics are subjected to heat during the process, and it is in this difference (which you may have guessed to the thermo prefix) that truly separates these two types of plastics and give them their unique qualities. As the name implies, thermoset plastics “set” after they cure during the injection molding process. 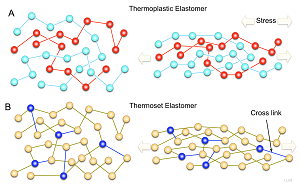 Thermoset materials start as a liquid and when heated a chemical process creates permanent links between molecular chains (cross-links) during the curing process. These cross-links provide additional strength, but at the cost of reusability. A common thermoset plastic is Liquid Silicone Rubber (LSR). Chemical Resistance: Due to their chemical bonding during the process, thermoset plastics are less susceptible to damage from chemicals and corrosion. Thermal Resistance: Because these plastics cannot be re-melted, they have higher temperature resistance. Higher Rigidity: They have an overall higher mechanical strength and dimensional stability due to the cross-linked molecules. While thermoset plastics have their strengths, they can also be weaknesses. This comes from not only their strengths but also their place in the industry in general. Availability: Before injection, thermoset plastics are liquids. Between handing, the need for modifications or special injection molds, and the general decline of use, they may be more difficult to find suppliers that carry them. Un-Recyclable: As mentioned above, thermoset plastics cannot be re-melted, and therefore cannot be recycled into new plastics. Lower Impact Resistance: While thermoset plastics have higher strength, they have a lower resistance when it comes to impacts. While harder, it tends to shatter instead of flex. Thermoplastics are the most commonly used type of plastic in injection molding, with two major points in favor of manufacturers: ease-of-use and recyclability. Thermoplastics come in the form of resin pellets. Depending on the needs of the client and the type of plastics, excess plastics from shearing and runners can be recycled back into the batch. A common example would be Acrylonitrile Butadiene Styrene or ABS plastic. The ability to re-melt plastics provides both an incentive in manufacturing and as a green practice. It also provides a versatile platform for many different types of thermoplastics. Recyclable: From plastic bottles to high-strength barrels, any recyclable plastic product is made with a thermoplastic resin. A benefit for green companies. Lean Manufacturing: Since waste during the manufacturing process can be recycled back into manufacturing, this provides a more cost-efficient process. Impact Resistance: Thermoplastics are generally more flexible and resistant to shattering due to damage and is more versatile than thermosets plastics. A thermoplastic’s strength can also be its greatest weakness. As it does not have the chemical cross-links and does have a higher melting point, it’s not for all applications. Lower Heat Resistance: Because thermoplastics can re-melt, they have a lower thermal resistance than thermoset plastics, including when it comes to electricity. Lower Chemical Resistance: For corrosive and caustic chemicals, thermoplastics are more likely to have a chemical reaction or degrade than thermoset resins. Your choice ultimately lies with your requirements and budgets. Need help? Midstate Mold and Engineering can provide suggestions to our clients on the entire injection molding process, from mold design to parts production, though the final selection is always in your hands. Read our blog archives for more common thermoplastics and more suggestions on picking the right resins for your project. Ready to get started? Contact us today.